During the night of Friday, November 26, 2009, there was a break-in at the Arthur W. Ericson Gallery in Portland, OR. 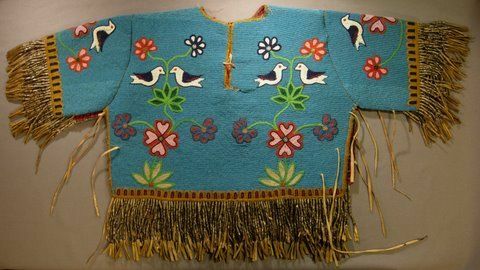 The stolen piece is a Plateau woman’s dress top, c. 1900. At the time it was stolen it was in mint condition. It is thread sewn on canvas with a red cloth lining. The beading is two needle spot stitch and the execution was excellent. The thieves broke through the display window in the store and were able to reach the piece and pull it off its stand and through the window. We have armorcote on our windows which make it harder for someone to put a hole through the window. However our coating was about 15 years old and the people who replaced the armorcote after the theft told me that armorcote becomes brittle and loses its strength after about 10 years.